three guitars and a drumset and no reason to worry, that is all NI needs to save the universe: exorbitant rock that uses musical templates like hula-hoops, free jazz from outer space that is weightlessly moving from countoured noise to bossa nova, playing Johann Sebastian Bach on the body's own substances. the Ni-crew was called up from members of other reckless bands like Tumido, Fang den Berg or Braaz. 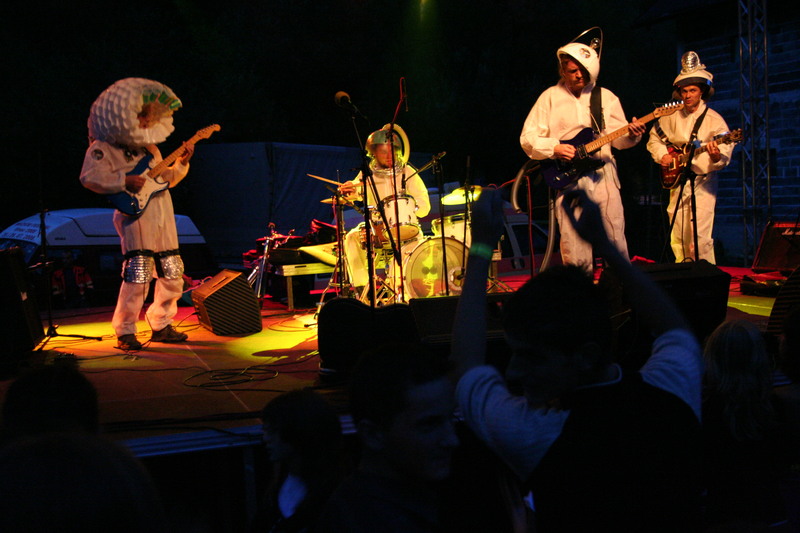 their first record was published in 2010 on Zach Records. several tours through europe left behind a thrilled and astounded audience. may 2012 they are touring again with their second vinyl »foxtrott« onboard that is beeing released on Interstellar Records. the rather surreal white spacesuit outfits have been replaced by dazzling yellow stretch overalls. along with the matching neon-coloured artwork of the vinyl the whole new appearance is beyond reasoning, high energy that is blindsiding you, just like the music - unconditional, massiv, complex and delicate at the same time. It's lunacy in the last stages. It's a free brain surgery that you will willingly accept with a smile.